Tickets are selling FAST, so get yours in advance! New extension dates announced. Don't miss this grand-scale Lyric production. ChiIL Mama will be there... will YOU?! Lyric Opera of Chicago General Director Anthony Freud announced today four additional performances due to popular demand for Lyric Opera of Chicago’s new production of Rodgers and Hammerstein's beloved Broadway musical The Sound of Music, April 25-May 25, 2014, at the Civic Opera House, 20 N. Wacker Drive. 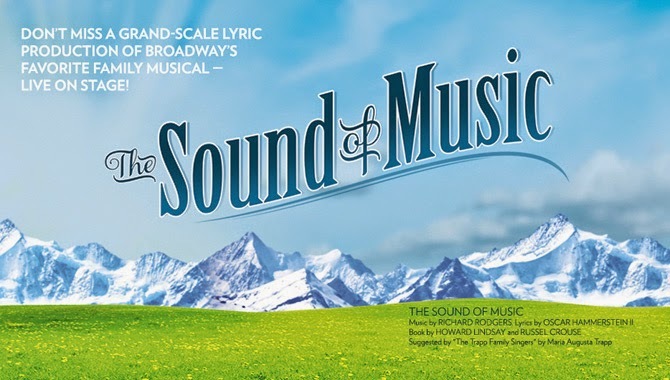 Additional performance dates are Friday, May 23 at 7 p.m., Saturday, May 24 at 1:30 p.m. and 7 p.m., and Sunday, May 25 at 1:30 p.m. Tickets start at $29 and are available now at lyricopera.org/soundofmusic or at 312-827-5600. The production’s all-star cast is led by Billy Zane, star of James Cameron’s international blockbuster Titanic and critically acclaimed for his portrayal of Billy Flynn in Broadway’s Chicago, as Captain von Trapp and Broadway star Jenn Gambatese as Maria. Also featured are Broadway and TV star Edward Hibbert as impresario Max Detweiler, renowned operatic sopranos Christine Brewer as the Mother Abbess and Elizabeth Futral as Elsa Schraeder, and local talents Betsy Farrar (Liesl), Brady Tutton, (Friedrich), Julia Schweizer (Louisa), Michael Harp (Kurt), Isabelle Roberts (Brigitta), KyLee Hennes (Marta), Nicole Sciemeca (Gretl), and Zach Sorrow (Rolf). The new production will be conducted by Rob Fisher (Lyric debut), directed by Marc Bruni (Lyric debut), designed by Michael Yeargan, choreographed by Denis Jones (Lyric debut), with lighting by Duane Schuler and costumes by Alejo Vietti (Lyric debut). Michael Black is chorus master. In addition to the stellar cast, 37 members of the Lyric Opera Orchestra will perform with a 25-member choral ensemble (including 12 members of the Lyric Opera Chorus). This company premiere is the second work in Lyric’s American Musical Theater Initiative, which launched last season with a new production of Rodgers and Hammerstein’s Oklahoma! The new Lyric Opera production of The Sound of Music is generously made possible by Exclusive Corporate Sponsor Northern Trust. Cosponsors: An Anonymous Donor, Brent and Catherine Gledhill, Robert S. and Susan E. Morrison, Mrs. Herbert A. Vance and Mr. and Mrs. William C. Vance, Mr. and Mrs. W. James Farrell, Jim and Vicki Mills/Jon and Lois Mills, and The Neundorf Trusts in Memory of Maynette V. Neundorf and John K. Neundorf. For more information on the Lyric Opera of Chicago’s production of Rodgers and Hammerstein’s The Sound of Music, please visit lyricopera.org/soundofmusic.